0450-1231 - CALIFORNIA 1 sticker. Shield peels off to shape & measures 2.5" wide x 2.625" tall. Printed to be fade resistant in the sun. Suitable for a bumper, outside of a window, or luggage. Printed in US. 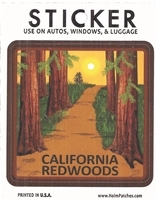 0450-1236 - CALIFORNIA US 66 sticker. Shield peels off to shape & measures 2.625" wide x 2.75" tall. Printed to be fade resistant in the sun. 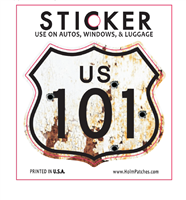 Suitable for a bumper, outside of a window, or luggage. 0450-7476 - 4.875" tall x 3.125" wide vinyl with a drilled hole to hang in a display rack. Peels off to shape & measures 2.375" wide x 3.625" tall. Silk screened to not fade in the sun. Suitable for a bumper, outside of a window, or luggage. This is a STICKER & NOT a decal even though it says it is a decal. 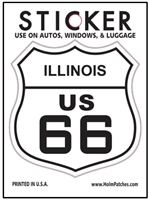 0450-6893 - ROUTE 66 sticker MISSOURI ILLINOIS CALIFORNIA ARIZONA NEW MEXICO TEXAS KANSAS OKLAHOMA - Shield peels off to shape & measures 2.625" wide x 2.75" tall. Printed to resist facing in the sun. Suitable for a bumper, outside of a window, or luggage. 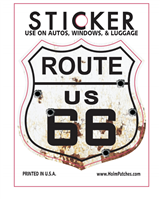 0450-6876 - ROUTE US 66 sticker. Shield peels off to shape & measures 2.625" wide x 2.75" tall. Printed to be fade resistant in the sun. Suitable for a bumper, outside of a window, or luggage. printed in US. 0450-8101 - 3 11/16" tall x 3" wide vinyl with a drilled hole to hang in a display rack. Shield peels off to shape & measures 2 13/16" wide x 2.75" tall. Printed to not fade in the sun. Suitable for a bumper, outside of a window, or luggage. Printed in USA.